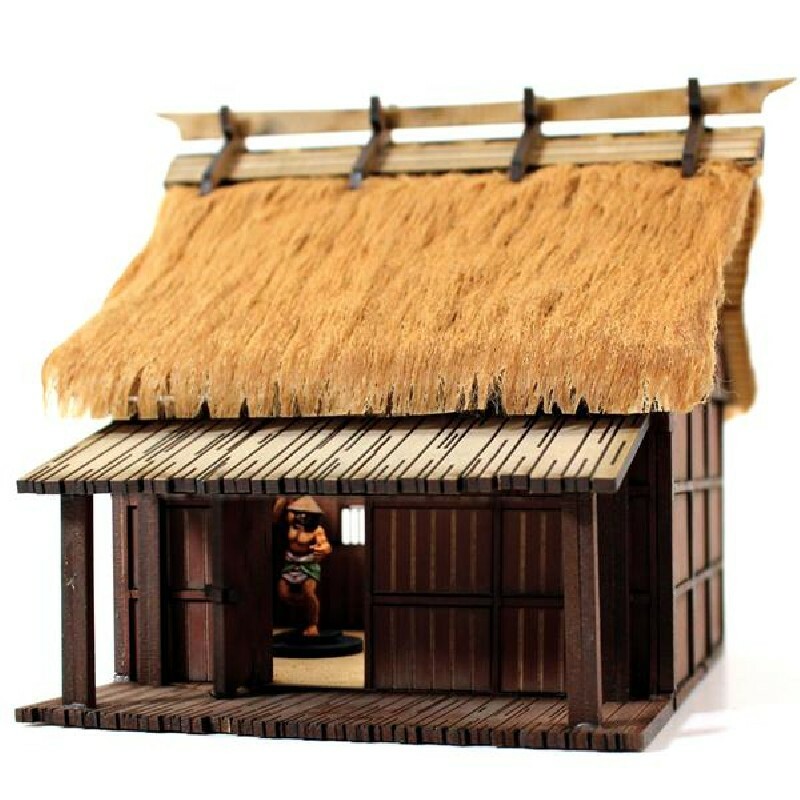 28S-EDO-102 Peasant Labourer's Dwelling, this is a “28Standard” 4Ground model with high detail and pre-painted parts. This is the most simple of lowland ‘Noka’ (farmstead dwellings). It would be the home to a family of ‘Mizunomi’ (farm labourers). This ‘Minka’ (vernacular built) dwelling is made from ‘Kyoro-Gumi’ (wooden post-framing), with timber boarded panel walls throughout. Even though this family is of low statues internally there is still the lower 'Doma' of ‘Doza’ (padded earth) where many household jobs are done and beside that the 'Hiroma' of 'Taka-Yuka' (raised timber flooring), where the family eat and sleep. Outside the front there is a ‘Hi-en Engawa’ (full length veranda) with a ‘Naga-ita’ (wood planking) roof. The dwelling has a ‘Buki’ (thatched) ‘Kirizuma’ roof, the ‘mune-jimai’ (ridge cover) is the relatively common ‘Oki-chi’. ‘Mizunomi’ (literally- Water Drinkers) were the poorest of the Hyakushou (Peasant Farmers), this their most common collective name, possible insinuated they were only worthy enough to drink water like animals. Such landless folk were also known as ‘Kabu’ (Turnips) because boiled turnips was all their families ate and ‘Atamafuri’ (head shakers) because as the lowest in village society they would be constantly bowing to their betters in the community. Among this group were the ‘Genin’ (indentured labourers) and the ‘Fudai’ (hereditary serfs). Life for ‘Mizunomi’ was very hard and often quite short, they were often beaten and even more grossly abused. They toiled as hard as beasts of burden in the village fields, but they also had the greatest burden to fulfill their village’s obligations of service ‘Yaku’. ‘Mizunomi’ would only get to join their lord’s Ashigaru (levy soldiers) when numbers were really low for a campaign and had to be made up with such lowly beings. If the son of a ‘Mizunomi’ family ran away to become an outlaw his family was punished for this crime.